My own flat is too brown. It needs colour. My long-term plan is a confused 1980s look, ie not too serious. I don't want it to look like a stilted retro-home. My sofas are dark brown. I had already replaced the tartan plaid with the livelier green-orange plaid. The other fabrics were inspired by it. The pied-de-poule is a nice wool to make into another throw. A friend of mine thought the red and ochre check gewöhnungsbedürftig, something to get used too, a bit difficult, like a dated interior of a camper van. 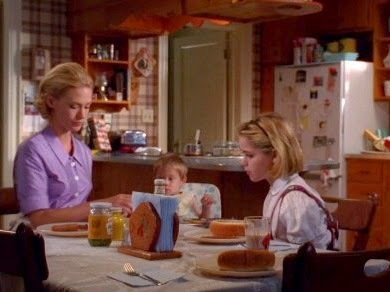 But I was much pleased to see that Betty in Mad Men, actually has a pretty similar wallpaper in her 1960s kitchen (grainy photos of the series from www.imdb.com). A photo of her in 1970s attire shows a good style-reference background. I think my fabric selection fits. So I spent yesterday sewing the fabrics together into cushion covers. The check for the front and the ecru for the back. 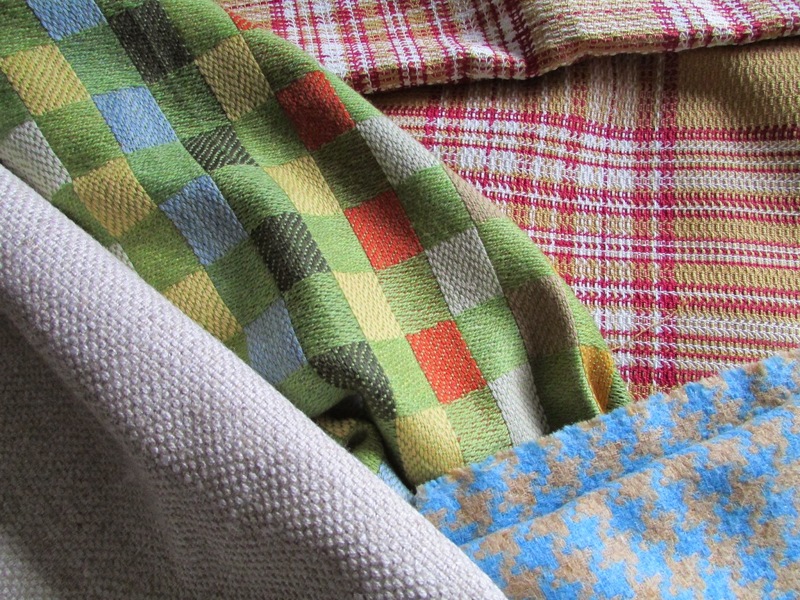 Both fabrics are thick and textured. A very nice feel. See the last photo for the result. 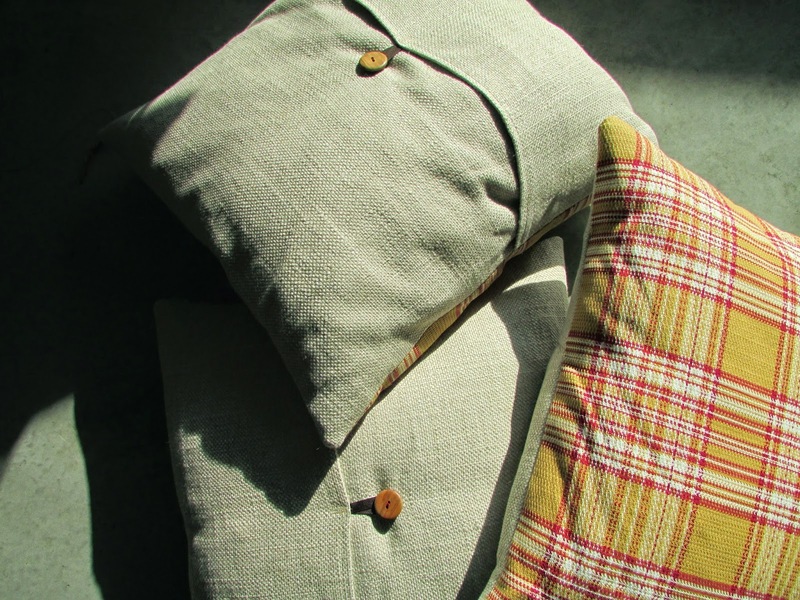 And here are three of the six cushions I made. 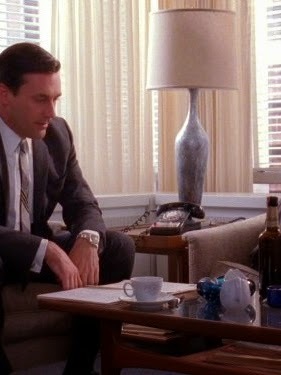 Next challenge is to replace the lampshades with something a bit closer to what Don has in his office (see photo below). 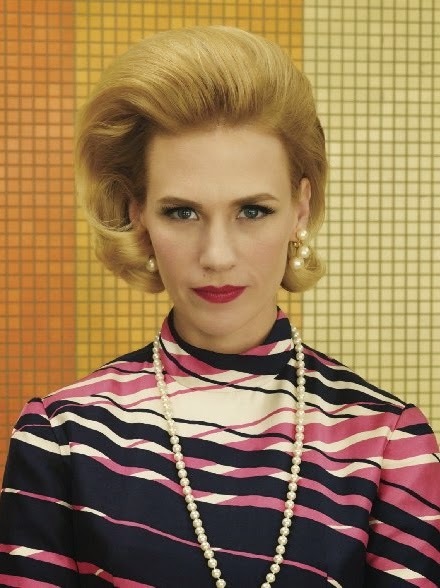 And in case you are wondering: I am in the midst of watching Mad Men, and am gripped by the story and especially the sets. The same friend who thought the fabrics were gewöhnungsbedürftig got me into watching it! Back and front in the sun.